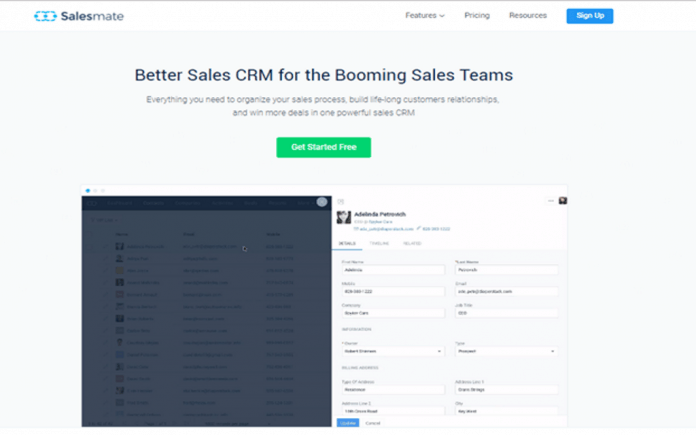 Salesmate is an integrated CRM solution with a wide range of features that can help a business capture more leads and manage its sales pipeline effectively. This tool is designed primarily for small businesses, helping in areas like business automation and management of a sales platform. My team and I found it extremely easy to use and we customized the platform according to our needs, which led to a positive boost in productivity and collaboration. It’s a time-saver, because every step of the pipeline is automated, letting you focus on areas that can help grow your business. The data management part is taken care of, so the team can come up with creative ways to engage and interact with potential customers. When a strong lead enters the pipeline, Salesmate will help you track their status and notify you about their recent interaction. This way, you can maintain communication with the lead until she becomes a customer. Sending sales emails is like a breeze with Salesmate. This tool will alert the salesperson when a user has received the email and opened it. The links clicked by the user after opening the email are also recorded. My team is able to track the movement of the user in the email and list down data about user interests based on this movement. The best part about sending emails through Salesmate is the personalization element that is offered along with a variety of templates. You can also craft a template of your own and give your sales emails a professional look. Bulk emailing is also easy, with the option to log the conversations through Smart BCCs. Forward an email to the Smart BCC address and let Salesmate do the rest. 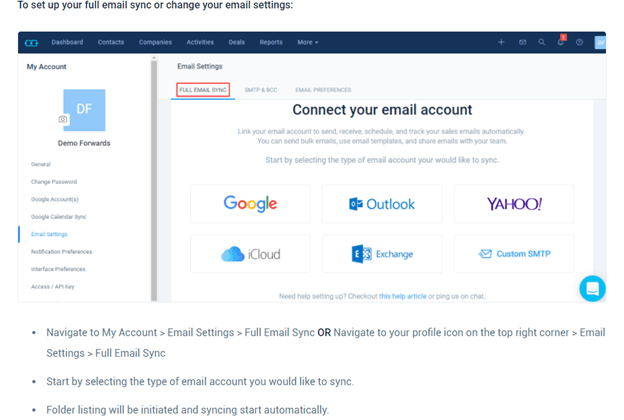 It will automatically categorize the email as per the right contacts and channel it to a relevant timeline. Salesmate is great in terms of integrations with other apps. This feature extends the usability of Salesmate and makes it easy for business of any size to work in a flow. Your sales team can focus on their tasks while remaining on the same platform. There is no need to switch between multiple platforms or divert attention by logging on to a new site. 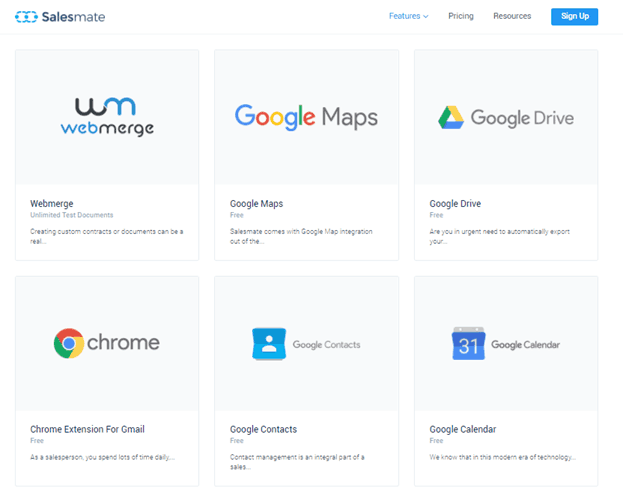 Salesmate integrates with third-party apps including Slack, Shopify, Ring Central, Active Campaign, Google Maps, Mail Chimp, Wufoo, Zapier, Squarespace, Webmerge, etc. and also sends you notifications about recent events that take place on each of these platforms. 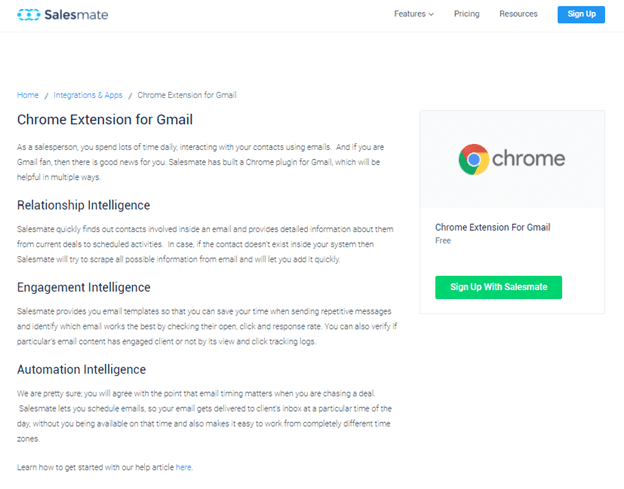 Salesmate integrates very smoothly with Gmail and Chrome – two of my most-used platforms for business. It provides complete coverage to all Google services on Chrome, like Google Calendar, Google Drive and Google Contacts. Whenever there is a hurdle in any function, the customer service at Salesmate makes up for it with their unlimited support and prompt support. Their YouTube channel is awesome too! I haven’t seen any other CRM platform uploading helpful videos and tutorials the way Salesmate does. Sales teams spend a lot of time logging calls manually. Salesmate has changed the game by allowing you to call, receive and log in with just a click. Also, you save time by auto logging and tracking the communication of prospects without any hurdle. My team and I used to work on a sales strategy that was built on the results gathered from previous campaigns. 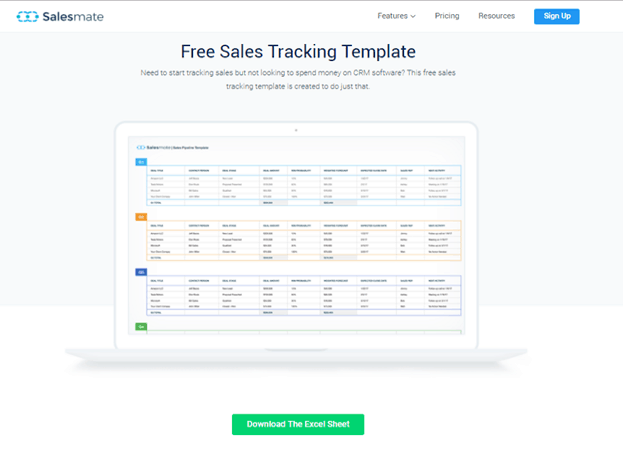 Salesmate.io helps compile reports thereby turning your sales goals into a plan. Your team feels motivated to do even better and measure the impact of their performance. We categorize our goals by day, week, month and even a quarter. The platform also allows healthy competition when the track record of each sales team member is measured separately. All guesswork is eliminated and you work with actionable insights to remove any roadblocks in your path to success. Salesmate is also available on both iOS and Android, allowing business owners to keep tabs on sales performance from anywhere, anytime. My team used to benefit from the app the most when they were on the field and had to send updates in real-time. The fast-paced world of today needed a sales solution that could be used on the go, just like this. 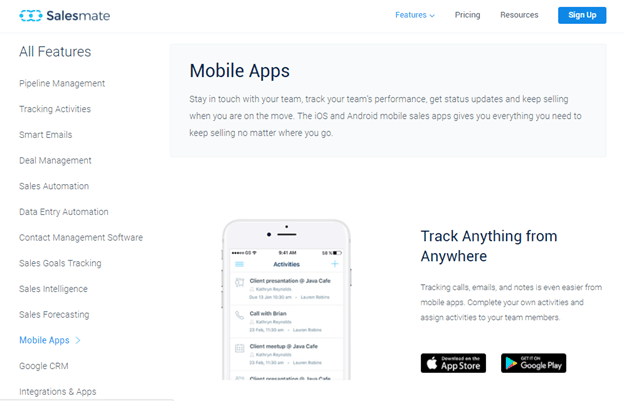 Incoming and outgoing calls to a prospect from your phone are tracked by Salesmate. Tasks on Salesmate can sync with tasks on your calendar so you don’t miss out on anything even when you are away from the computer. 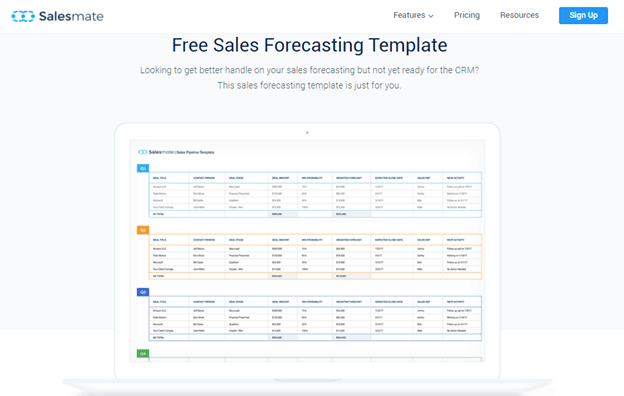 I couldn’t believe that the entire process of sales forecasting could become this easy for a business owner. I work with actual, insightful data to measure my current campaigns and optimize future campaigns. This helps me target tangible goals and refrain from spending on areas that aren’t contributing to the overall growth of the business. Salesmate provides clear, concise pointers of your sales cycle that can be shared with the marketing department as well. Both sales and marketing can work in collaboration to achieve better, faster and more impactful results. Salesmate is a very intelligent platform that completely changed the way I do business. It adapts with my business needs and keeps automating the sales process. It is very easy to set up and run and extremely affordable for the small business owner of today. No other CRM platform pays this much attention to customer service and how-to tutorials the way Salesmate does. None of my new reps had difficulty understanding the interface, because every step is made clear on the platform. You just have to keep moving the deals accordingly. All in all, Salesmate is a one stop shop containing most of the functions required in the professional sales industry of today. When your routine data management, call logging and emailing processes are automated, the team can work harder and smarter on coming up with innovative sales strategies and focus on securing more leads.